Despite what you may say, we can all admit that the G5 is a pretty nice machine. Sure, it may be overpriced, sure, it may be not the fastest, whatever…it’s a nice machine. 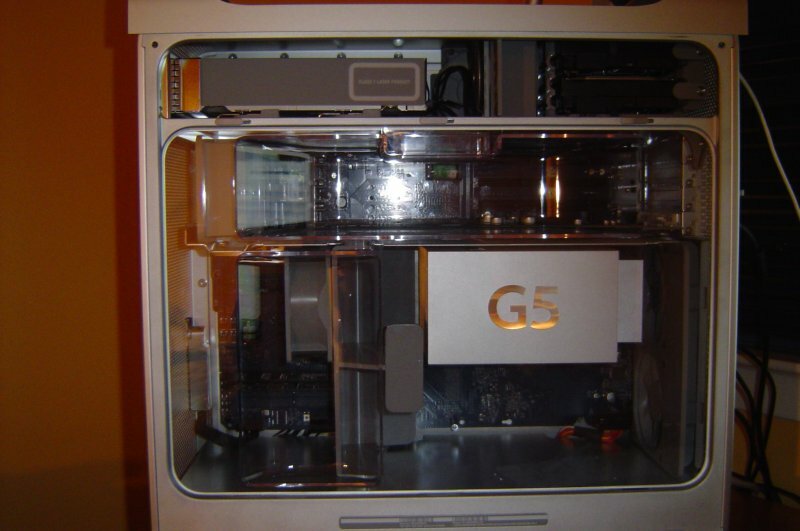 Therefore, I thought it would be quite interesting to review the Apple Powermac G5, which just may be the most controversial computer in the past few years. Instead of reviewing the top-of-the-line Dual 2Ghz G5, I thought it would be best to go with the low-end 1.6Ghz G5, for two reasons. First off, the majority of the population can’t buy a $3000 computer, $1800 is more realistic. Second, the 1.6Ghz was the only one I myself could afford ?. 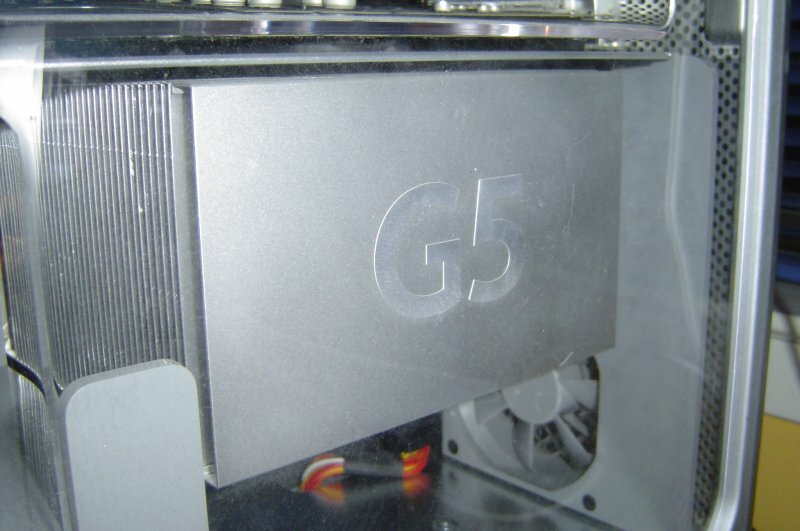 So here we go, into our second Apple computer review, of the Apple Powermac G5 1.6Ghz! The specs are pretty impressive, I must say. The 1.6Ghz processor is a little low of a clock speed, but clock speeds are not all in a processor, as hopefully, you know (think of AMD vs, Intel). 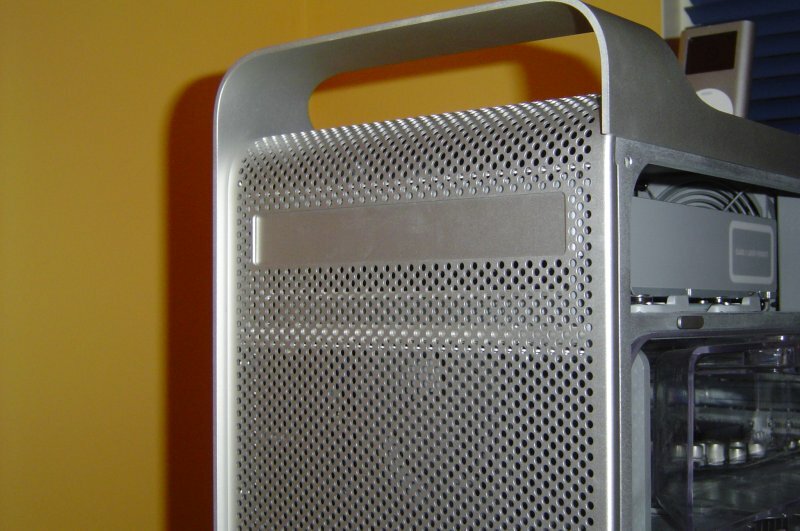 The Powermac G5 is, in my opinion, the best-looking Mac, ever, by far. The iMac comes close, I must say, but the G5 has such sleek, classy, professional look. If you keep the side panel off while using the machine, it looks even more impressive. The entire case is made out of anodized aluminum, and the front and back are covered in little “holes.” There are so many, I would say that the front/back panels are only about 70% material. Not only does this help the appearance of the G5, it also helps airflow. Both side panels have nothing on them with the exception of the Apple logo in the middle of both. It looks very classy. On the front panel, you’ll find quite a few things. First off is, of course, the power button. There’s also a headphone jack, a Firewire 400 port, and a USB 2.0 port. Lastly, there’s the optical drive tray. This brings me to my first disappointment with the G5; it only supports one optical drive “at a time.” Even the previous Powermac’s had multiple drive trays. While I’m sure the simplicity of simply one optical drive looks best, sometimes, you need to figure functionality over design. I hope that in the next Powermac revision, Apple will add the second optical drive bay. There are quite a number of ports on the back. On the top are the PCI/PCI-X slots (depending on which G5 model you choose), and the AGP 8x slot (video card). Below that you’ll find the location to install your Airport Extreme and Bluetooth antennas (both optional and cost extra). Below that are the optical in/out ports, the audio ports, two USB 2.0 ports, a Firewire 400 port, a Firewire 800 port, a 10/100 Gigabit Ethernet port, and lastly, a 56K v.92 modem. The back is very well organized and looks quite nice. Taking off the right side panel reveals the “innards” of the G5. This has really got to be the neatest computer interior I have ever seen. Everything seems to “fit” together, and it really does work. There are 9 fans inside the case, which may lead you to think that this is one loud sucker, but it is quite the opposite. In fact, it’s quieter then any PC that I’ve ever used. How is this, you ask? It’s quite ingenious, actually. There are four cooling zones in the PC. The top part, where the optical drive/HDD’s are located, the middle/top part, where the PCI-X/PCI/AGP cards are, the middle bottom, where you can find a processor, and the bottom, where, on dual configurations, you’ll find another processor. There is a thermal sensor in each zone. During normal use, the fans run extremely slow, so they produce almost no noise. If a certain zone gets hot, only the fan(s) in that zone speed up, so while there is more noise being produced, it is significantly less then having all 9 fans speed up. Apple sure did think on this one, and the final result is impressive. What really surprised me about the interior of this PC is the fact that the heatsink is so incredibly large. It has got to be three or four times better then a average PC heatsink, which can clearly tell you that the G5 processor gets hot, most likely, very hot. The heatsink was never hot to the touch, and no part of the system really got burning hot, with the exception of the video card, which is understandable. When you first remove the side panel, there is a plastic “covering” that you must take off before you have access to the components. Taking this off while the system is turned on sets off flashing red lights (literally) and the PSU fan gets extremely loud. Therefore, this is not recommended. 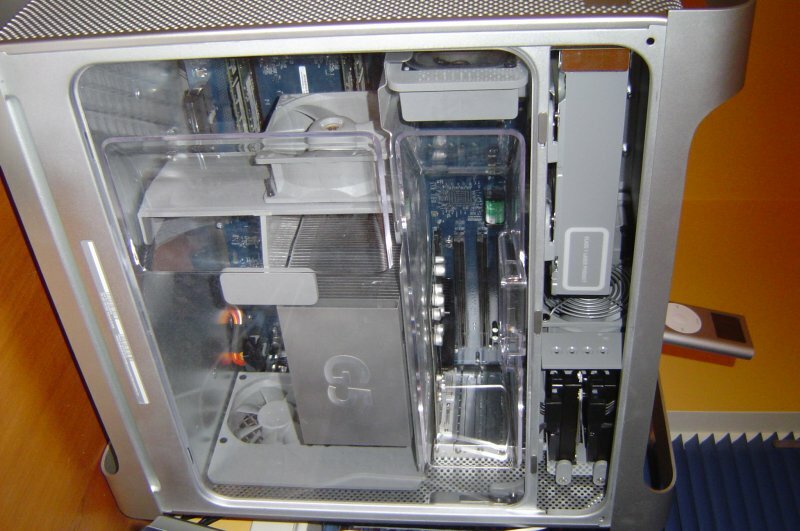 The main selling point of the Apple Powermac G5 is it’s 64-bit support, as well as backwards compatibility with 32-bit, something that is only available on the Athlon 64 for the PC platform, and the G5 came first. 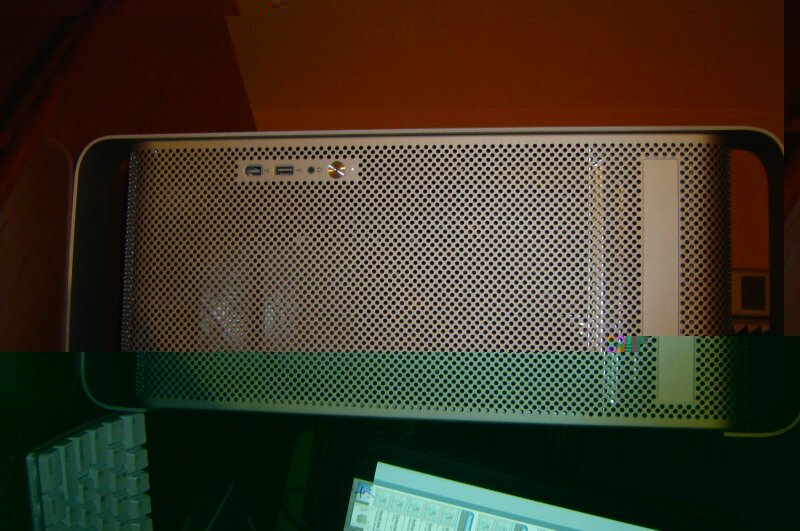 If you are interested in the technical aspects of the IBM PowerPC 70 (G5) chip, I urge you to read “Inside the IBM PowerPC 970” at Arstechnica , its one of the best articles I’ve read in a long time, and it provides a very in-depth look at the 970 chip. The G5 has a huge motherboard, probably about 150% of the size of a standard ATX motherboard, and it is jammed pack with stuff. There are two SATA controllers with on-board RAID, and one IDE controller for the optical drive. You’ll also find 8 RAM DIMMS, (4 on the 1.6Ghz model), supporting up to either 4GB or 8GB of RAM, depending on the system model. Both dual processor models support 8GB; the single processor model supports just 4. “Yeah, it may look great, but how does it Quake?” Well, this is not a gaming system; so don’t even bother asking about games. Unless you put the 9800 Pro in this sucker, don’t expect to be able to even compare to a PC gaming system. Even with the 9800 Pro, PC’s are much better for gaming then Macs are. I am a Mac lover, but I do have to admit that. Gaming aside, the best benchmark for Macs in my opinion, is Xbench, and therefore, I’ve decided to use Xbench in my benchmarking for this review. In order to compare, my old Revision A Powerbook G4 (12”) 867Mhz laptop with 640MB of RAM got an overall score of 84. This is almost twice that score, which is pretty damn good! 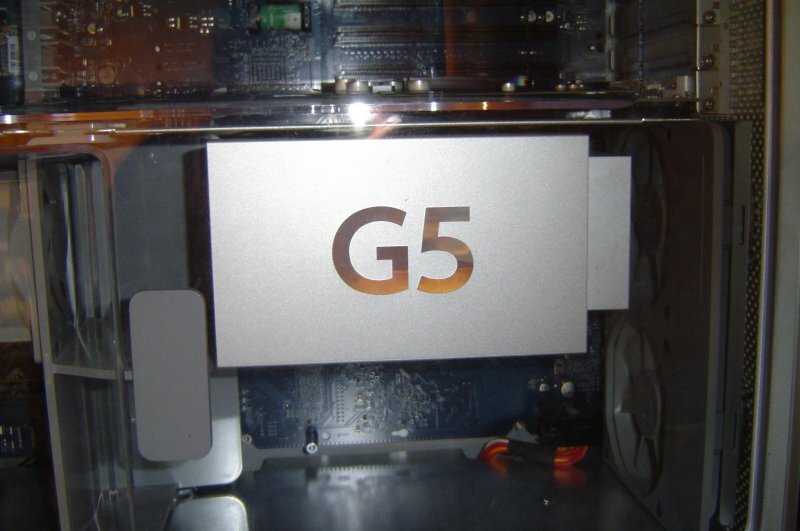 When I first saw the G5 when it was first released, my exact words were “bla.” I mean, they advertised it as the fastest personal computer in the world, but I didn’t take this claim seriously, considering they have made in the past with other machines, yet after further testing, it came out that these reports were false. I was right to not believe this convincing claim. The G5, 1.6, 1.8, Dual 1.8, or even Dual 2Ghz, are not the fastest personal computers. Yet, they are fast. Blazing fast, actually. There is no comparison between this system and my Athon XP 2400+ Shuttle XPC system that I use as well. The G5, you could say, runs circles around my PC. It is simply so much faster, with Photoshop, Premiere, and even simple day-to-day tasks such as web browsing. However, there are downsides. 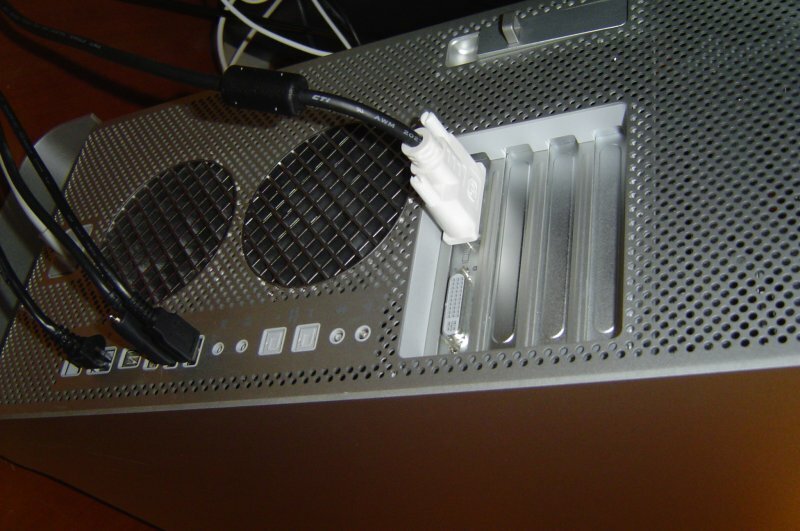 First off, it can fit just two hard drives, while the Powermac G4, the previous Powermac generation, could fit four. Yes, these are SATA drives, while the G4 used PATA, but two hard drives is simply not enough for many people. There’s also room for one optical drive, which can be frustrating as well. Although the G5 case is significantly larger then the G4 case, it fits less. This is, of course, due to its abnormally large motherboard, but still, it’s a great inconvenience to have these limitations. I also thought Apple could put a few more USB 2.0 ports. I found myself using two USB 2.0 ports on my monitor, as well as all three on the G5 itself. 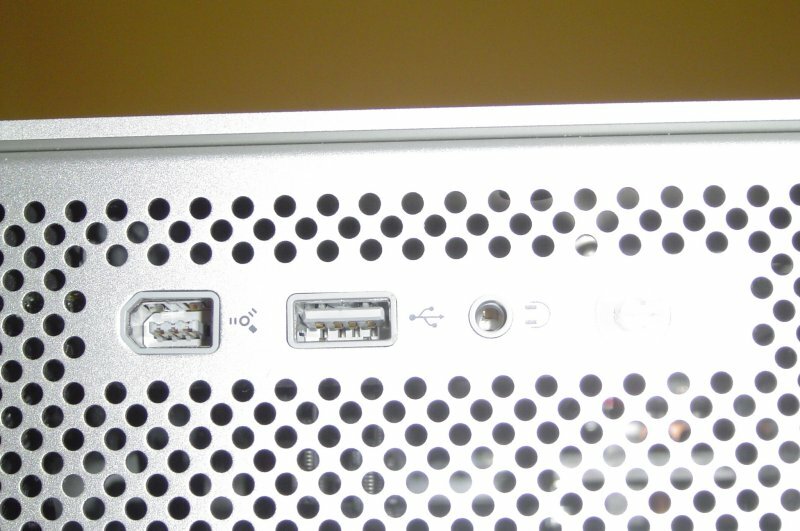 I would like to see no less then 6 ports on the computer itself, with two (instead of one) USB port on the front. 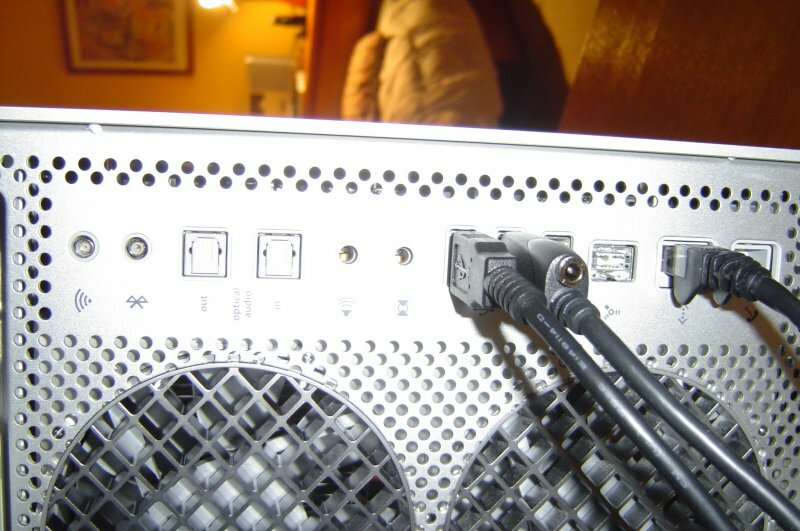 In my opinion, two Firewire 400 ports are suitable, but some may want more. One Firewire 800 port should be plenty for now. Besides these relatively minor issues, the G5 is virtually flawless. If you like OS X, crave speed, and need design, look no further; the G5 is your answer. Just be sure you are ready to pay up for it, it does not come cheap.